Eisenstein, Pudovkin, Dovzhenko, Vertov: these Soviet film directors are acknowledged to be among the greatest in the history of cinematography. To Eisenstein we owe such films as Battleship Potemkin and October; to Pudovkin Mother and The End of St Petersburg; to Dovzhenko Earth and Zvenigora; and to Vertov The Man With a Movie Camera and The Three Songs of Lenin. 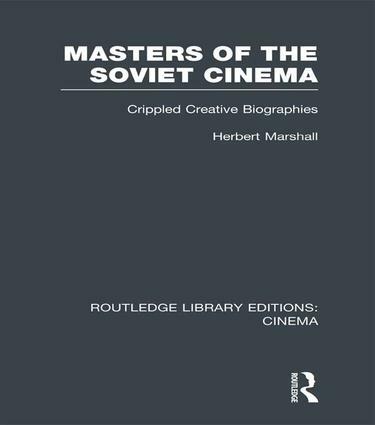 Herbert Marshall knew each of them personally, both as artists and as friends, and shared their cinema world when he was a student at the GIK (The Moscow State Institute of Cinematography) in the heady years following the Revolution into the period of the first Five Year Plan. His material is culled from personal recollections, diaries, notes, unpublished and published biographies, letters, press cuttings, articles and books in various languages, but mainly from Soviet sources and the Soviet cinema world. Taking the subjects one by one, this indispensible book discusses their major films including an account of their creation and reception in the USSR and abroad. It shows the tragedy of these four Soviet artists who were lucky enough not to be arrested or deprived of their limited freedom, yet who nevertheless ended up with ‘crippled creative biographies’. The author then examines the changed viewpoint in the climate of 1983 when the book was originally published.